AV Club: Adapting Shirley Jackson's novel The Haunting Of Hill House, Wise (who squeezed in the project between directing West Side Story and The Sound Of Music) and screenwriter Nelson Gidding keep the ghosts off-screen. In fact, they might not even be there at all. 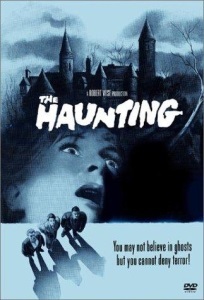 Set in a tragedy-attracting house that was "born bad," the film unfolds over a couple of days during which iconoclastic anthropology professor Richard Johnson plays host to Hill House heir Russ Tamblyn, psychic Claire Bloom, and sensitive soul Julie Harris in order to study the house's supernatural qualities. He doesn't reckon on Harris bringing her own ghosts with her. On a commentary track featuring Wise, Gidding, and the four leads, Gidding recalls asking Jackson whether her novel could be read as the story of one woman's nervous breakdown rather than that of a haunted house. "No, but it's a damn good idea," Jackson replied, and The Haunting owes much of its success to the way it runs with the notion. Empire: Though it deserves its reputation as one of the most purely terrifying of all celluloid ghost stories, Robert Wise's 1963 film version of Shirley Jackson's 1959 novel The Haunting Of Hill House is actually a character study before it is a horror movie. A lengthy, narrated prologue — a little like the preface to Hammer Films' version of The Hound Of The Baskervilles — establishes the evil history of a New England mansion built by mad patriarch Hugh Grain. Hill House has been the site of many tragedies over 80 years, but Jackson believes, and Wise suggests, the place isn't really haunted until Eleanor Vance (Harris) moves in. Along with Theodora (Bloom), a slinky psychic, and Luke (Tamblyn, held over from Wise's West Side Story), who expects to inherit Hill House one day, Eleanor has been recruited by the suave-but-cranky parapsychologist Dr. Markway (Johnson) for a study project in the supernatural. Like Jack Nicholson in The Shining (1981), Eleanor is at once terrorised and seduced by the house and, at the end, becomes its resident ghost. She is included in Markway's experimental party because of a Carrie-like adolescent burst of telekinesis, which bombarded her childhood home with pebbles — an event which she still hotly denies. Everyone of the manifestations that torment the intruders throughout the film are, in fact, just side-effects of Eleanor's sustained psychic assault on herself. This is underlined by the opening and closing statement that "Whatever walked there, walked alone", which affirms that poor Nell, dead on the grounds, is the only ghost that has ever haunted Hill House. God, god. Whose hand was I holding?! Great post, superb film, sublimely terrifying book. I don't know if this link will work for everyone, but Patricia White wrote an excellent article on the movie that addresses the house as a space, female spectators, and the coded lesbianism of the film. It's a bit on the academic side, but not so much as to be difficult to follow. Stephen King wrote a coke-fueled survey of late 20th century horror that examined this novel and film (and others) in terms of narcissistic protagonists. Great film based on a great book. Thanks for the post. So, 'born bad' or not, maybe the house had just been waiting for Nell all along? Maybe in a similar sense to how Jack had 'always' been the caretaker of the Overlook Hotel? Maybe souls form affinities to places, in those vast stretches of time before or after they become tethered to bodies, and maybe (tethered or not) they're drawn to those places? I mean, as long as we're already positing the supernatural (to whatever degree we do so in our appreciation of scary stories), there's no reason to expect that our familiar natural order would apply to a universe that includes such things. Maybe the unidirectional flow of time and our conception of causality are just side effects of our myopic meat-bound mortality. hear a thing, but he could. the place, where is the man?" the voice himself. The next time, the minister came aboard and sailed along. After that the voice was heard no more.